Strawberry Spinach Salad with the works! Such a bright and refreshing summer salad! This fresh spinach salad is layered with sweet strawberries, tender chicken, crunchy walnuts and tangy feta and it’s finished with a creamy poppy seed dressing. 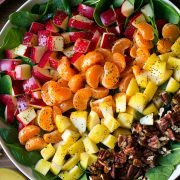 Summer will have come and gone before we know it so I hope you are all enjoying an abundance of salads in your diet featuring all the fresh fruits and vegetables that are in season right now! 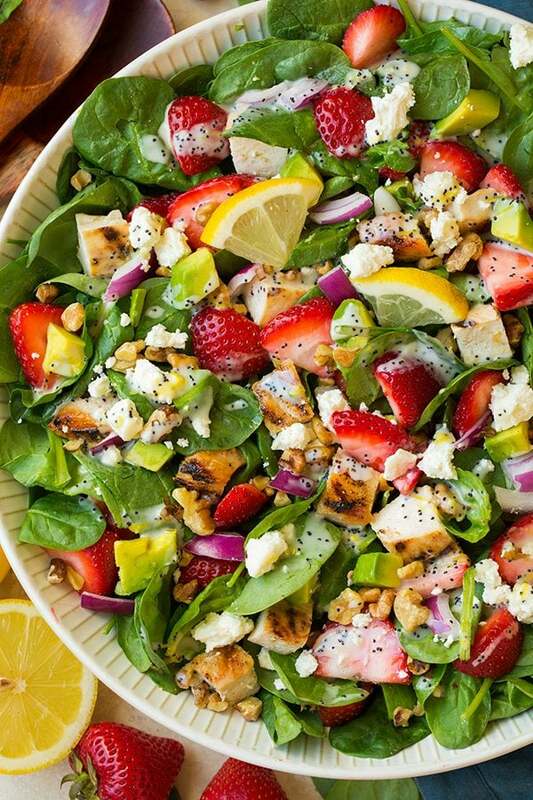 If you are like me you’ve got quite a list of salads that you want to make throughout the summer, but at the top of that list should be this perfectly bright and summery Strawberry Avocado Spinach Salad with Grilled Chicken and Lemon Poppy Seed Dressing! 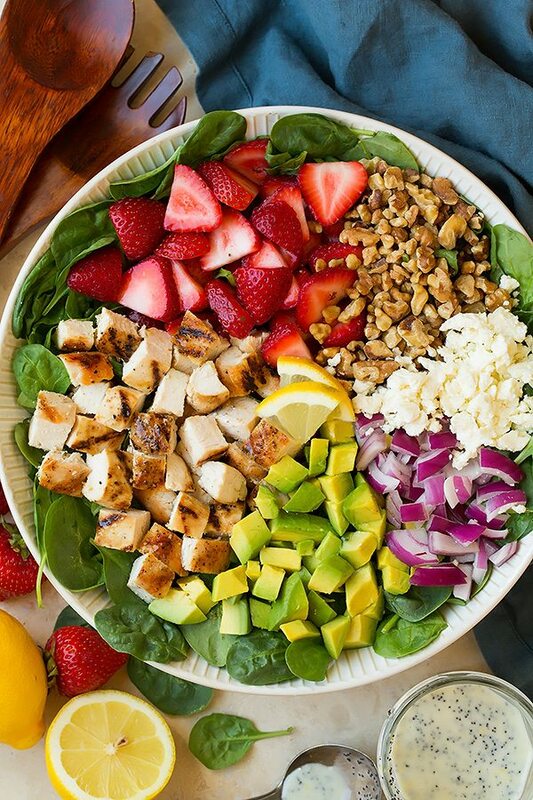 It has the perfect blend of flavors and it includes so many healthy ingredients like spinach, strawberries, avocados and lean chicken breast. And of course let’s not forget one of the main highlights of the salad – the perfectly tender and crunchy, wonderfully nutritious Fisher Walnuts! This salad just isn’t complete without them! 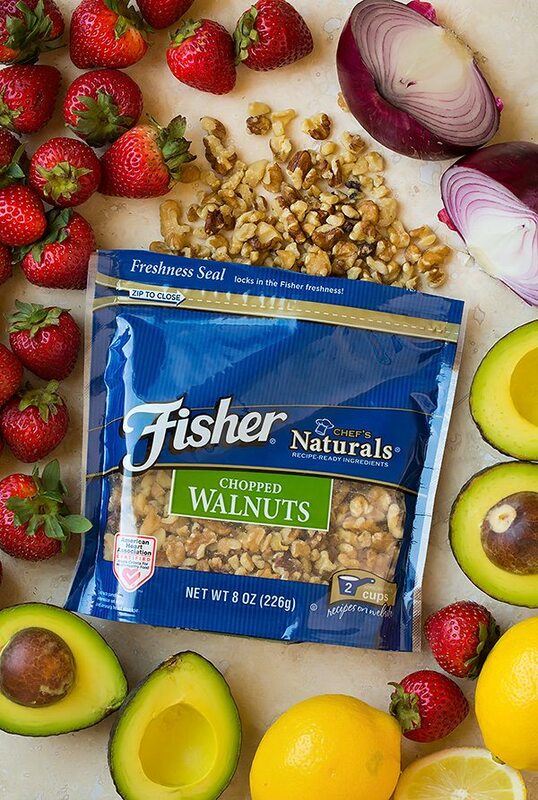 Most of the time you’ll find me adding some sort of Fishers nuts to my salad because a salad needs that crunch and delicious nutty flavor. Here they really just finish this salad off, plus they make it just that much more filling which is important since this is meant to be served as a main dish. I love walnuts not only for their delicious flavor but I also love the fact that they are a healthy food to include in my diet. I love when a food not only tastes great but it’s good for you too! Walnuts have so many health benefits (while they include things like omega 3 fatty acids, antioxidants and protein), they are definitely good food to include regularly into your diet! I always keep them stocked in my pantry, not just for baking and cooking but for snacking too. And of course I choose Fisher Walnuts over other brands not only for their quality but because they are made without preservatives. Nuts shouldn’t need preservatives yet other nut brands are adding them, it’s great knowing Fishers doesn’t. Even more reason to add then to this delicious salad! You’ll love the lemon flavors in this dressing. 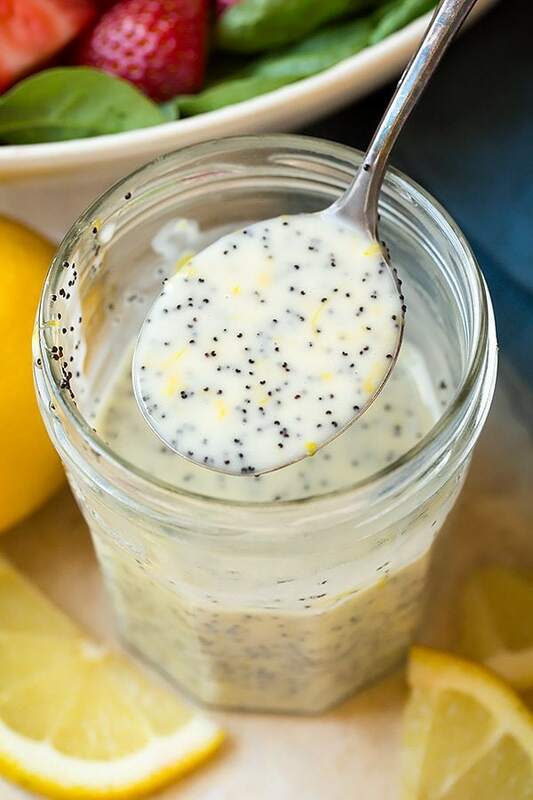 We’ve all had the classic poppy seed dressing but when you add lemon to it delicious things happen! 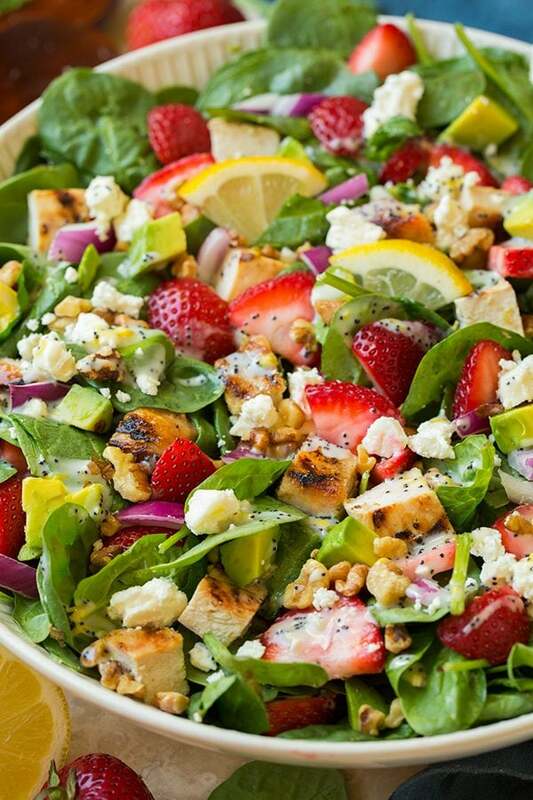 Strawberry and lemon are the perfect flavor pairing and it’s the best way to finish this salad! 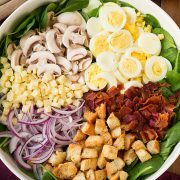 More Spinach Salad Recipes to Try! Such a bright and refreshing summer salad! This fresh spinach salad is layered with sweet strawberries, tender chicken, crunchy walnuts and tangy feta and it's finished with a creamy poppy seed dressing. For the lemon poppy seed dressing: Whisk all ingredients in a bowl until well blended. Cover and store in refrigerator until ready to use. 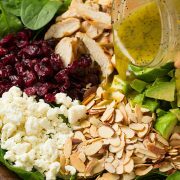 For the salad: Layer spinach and chicken among 4 plates or into 1 large salad bowl then layer over remaining salad ingredients. Spoon dressing over salad and serve immediately. This is a sponsored conversation written by me on behalf of Fisher. The opinions and text are all mine. Thanks for supporting the brands I love which help make this blog possible!